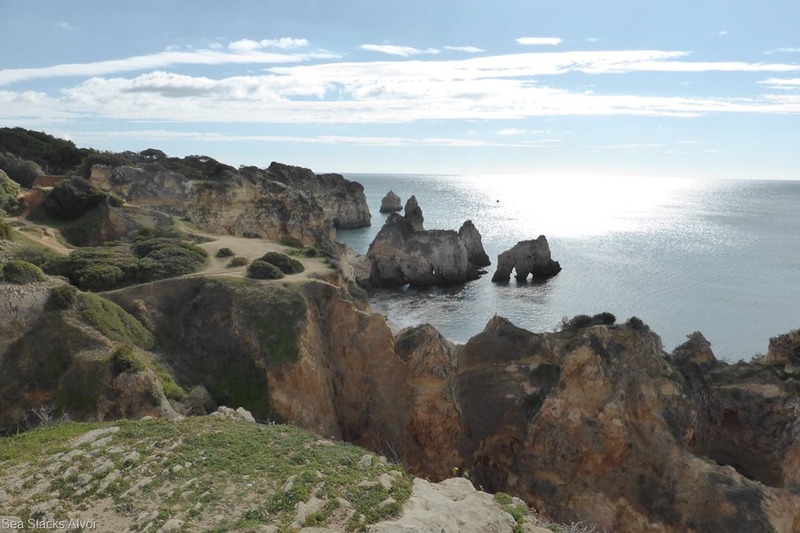 After our quick getaway from the really nice Lagos Camper Stop, after the battery alarm went off, we arrived at Alvor one at 10am just a 20km drive. Not a lot different just a large clay area with Motorhomes everywhere. Steve walked around, cables were stretching all over the place from the electric cabinets but he found every electric point was occupied, Oh dear! 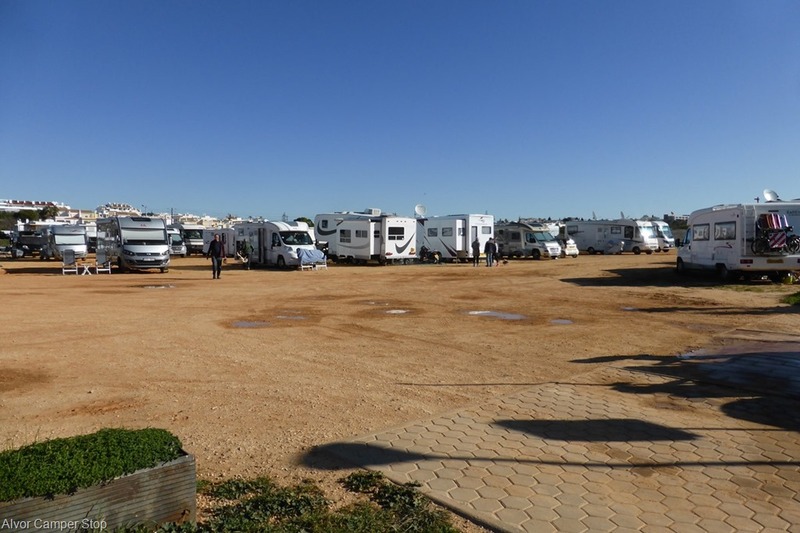 Just then an English voice said “Hi there!” it was an English couple we had met in the Camper Park in Silves. He said; “If you want electric we are going shortly.” So we manoeuvred very carefully between the other Motorhomes to get in front of him and plug in as soon as he unplugged then reversed back into his spot as soon as they left. Phew we can get the batteries back up again, it only takes about a day to fully charge and condition them. The fairly grumpy manager who had been shouting to Steve to go and book-in, arrived pad in hand and we paid for one night with electric, €7. Without electric it was €4.50 slightly more than Lagos, free water but no WiFi, but It was the electric that we needed most though just at this moment. It is quite a strange setup here, because, directly opposite the Camper Stop is a nice car park where camper parking is tolerated, probably because the Camper Stop is usually full, with many long termers who have set up for the season or perhaps permanently. The two guys who manage the Camper Stop, one in the morning, one in the afternoon seem to make it their life’s work, quite rightly perhaps, to stop the free campers opposite from using their facilities, however, they are only there from 9am to 5pm and leave for lunch 12pm to 1pm. So when they leave they turn off the water, which of course inconveniences the paying customers who also can’t use it if they suddenly run out in the evening. It gets quite funny watching them chase after a Motorhome who has driven past their little caravan to the service point, just in case they are not paying. In fact the car park across the road is much nicer with a firmer surface, palm trees for shade if you needed it and individual lanes that could take about ten motorhomes each. 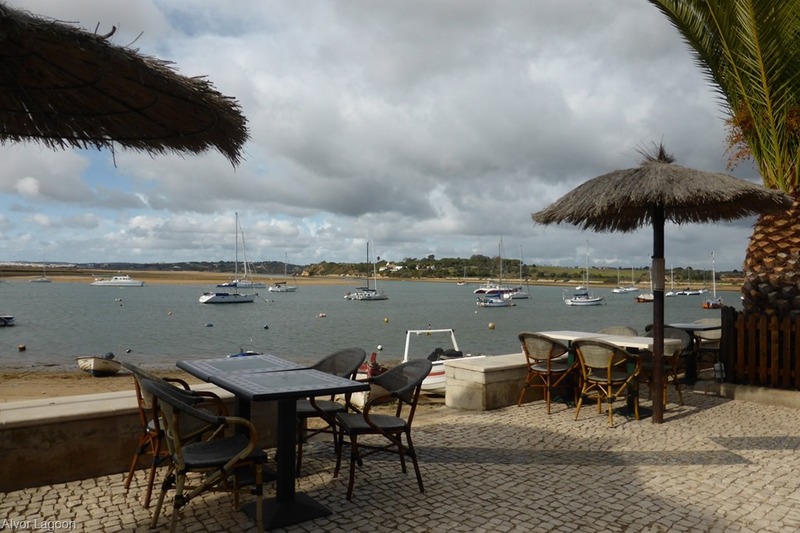 We took a stroll and were amazed, Alvor is a lovely town, with so many restaurants, cafe’s and pubs many of which are open even in February, we were delighted to find two Indian Restaurants as that is something we miss in France but we later found four more. So that’s tomorrow night’s meal sorted (it’s a fasting day on Wednesday’s in our 5:2 regime). 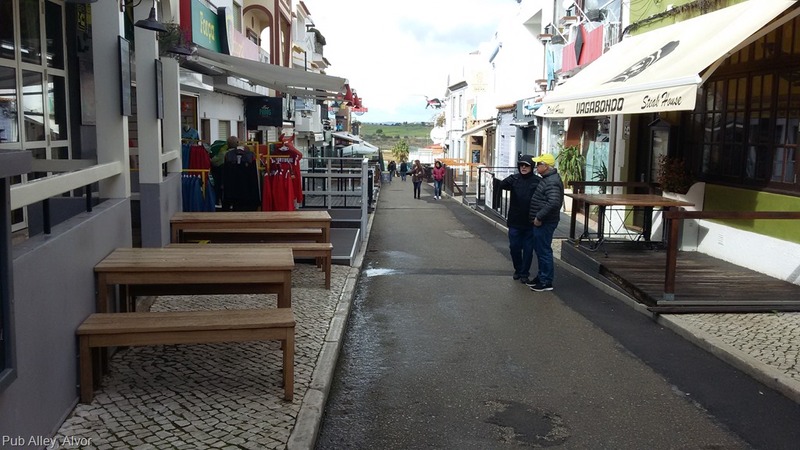 Almost every business in this road, nicknamed “Pub Alley” was a pub, sports bar or restaurant and every turning revealed more. 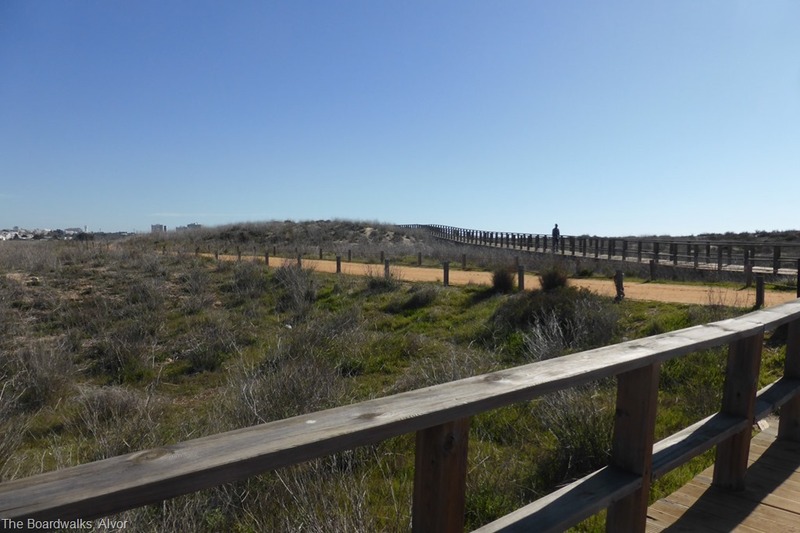 Between the large protected lagoon which is connected to the sea by a narrow channel, was a marshy area and sand dunes. These were crisscrossed by really nice board-walks and hard clay paths. 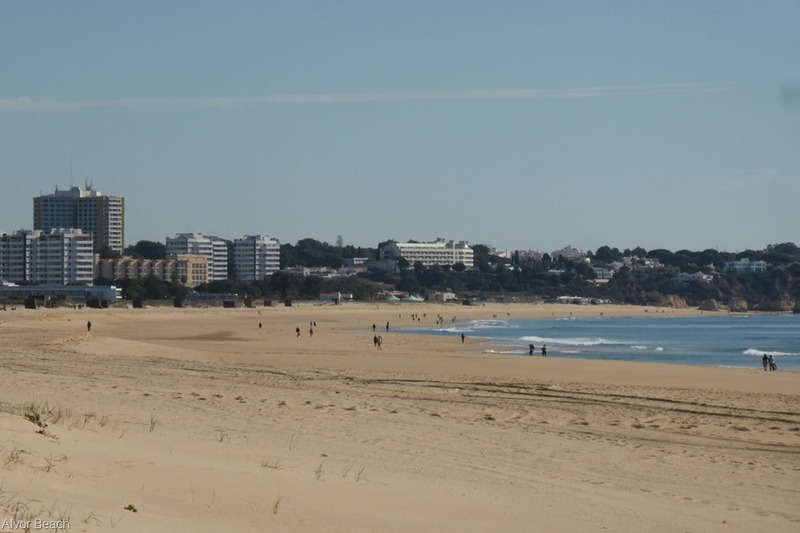 One boardwalk stretched for 3km to the west from the Camper Park and 2km to the east so ten kilometres round trip of flat walking, absolutely ideal for our new regime. It was so nice that we decided to pay for another four nights and ended up staying for seven in total. But because it was sunny our batteries were topped up to 100% each day so we didn’t need electric for the rest of the time. The only thing this place needs is Wi-Fi but we have our mobile data, but it’s metered usage so not quite as good as on-site internet access. We certainly made the best use of the boardwalks with long fast walks morning and evening. 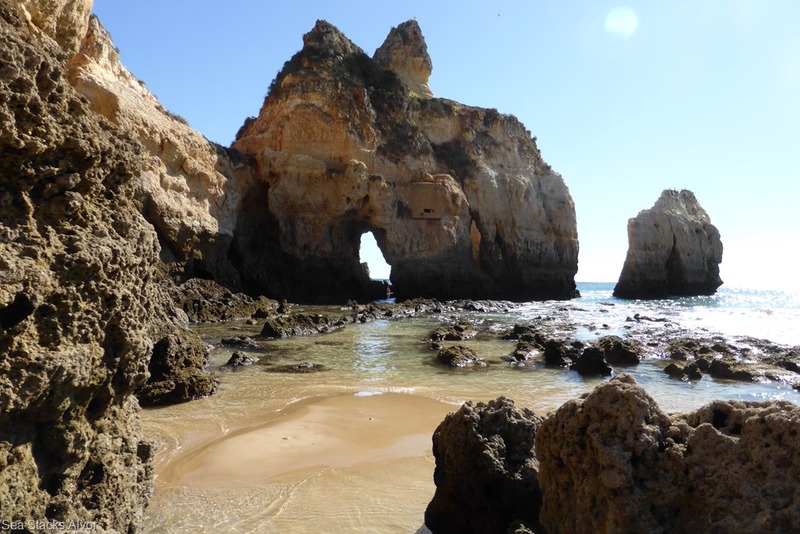 To the east at the end of the golden beach were beautiful sea stacks. 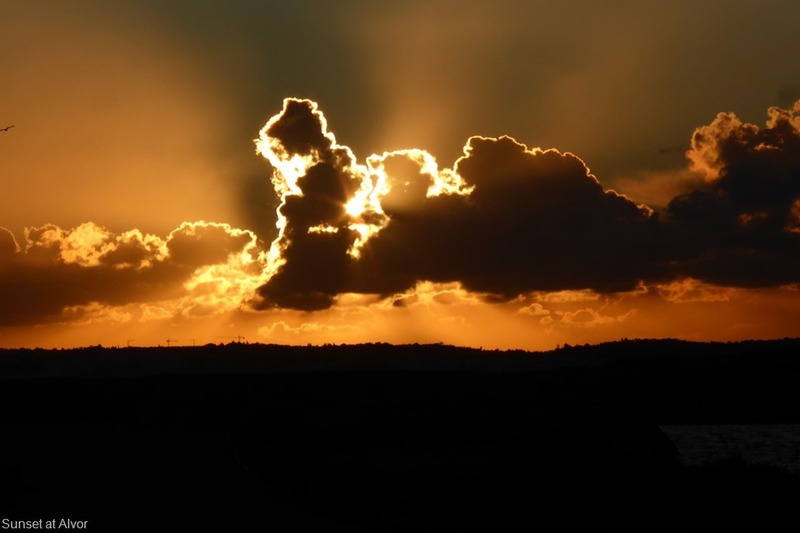 At the west we were treated to glorious sunsets. 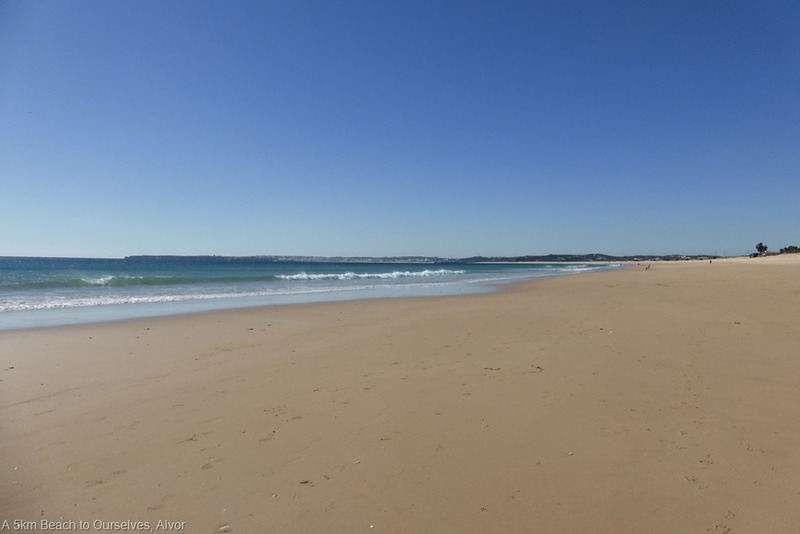 Tuesday 6th February 2018, this will have to be our last day here at Alvor, our gas is getting very low. We invited Margaret & Shirley in for supper in evening as they are moving on tomorrow as well. 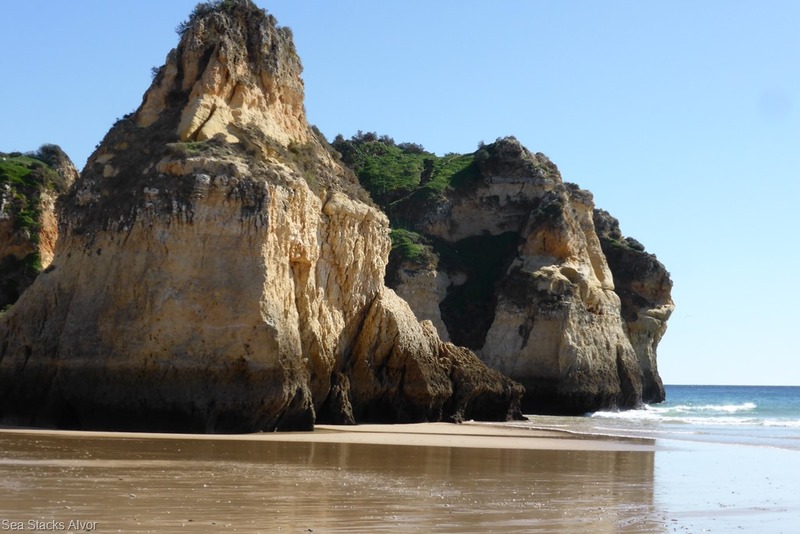 We had our final walk at Alvor along to the Sea Stacks at the eastern end of the beach they were magnificent and although the sun was out there was quite a cool breeze. We had a great evening with Margaret & Shirley, it’s funny, we meet many, like minded, people on our travels, some you pass the time of day with others somehow just click and you become firm friends. I am sure we will meet up with Margaret & Shirley with Poppy & Boo for many years to come and we will keep our eye on their travels with their Blog as I am sure they will with ours. Luckily the Gas held out for the evening.